This well known online makeup store has just released three new types of lip gloss, each with its own distinctive finish. We’ve brought in hundreds of new products... and these unique lip gloss colors are like the icing on the cake, you might say. Lady de Cosmetic, one of the largest online cosmetics retailers, is growing bigger still. 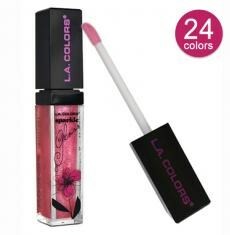 They have just announced the addition of some new lip glosses from L.A. Colors. “Jellie” lip gloss comes in solid colors and has a smooth and shiny patina, “Shimmer” has an iridescent quality and “Sparkle” has sparkling flecks of glitter. There are 24 colors in all. And these festive new lip glosses are only the beginning. Studies show that luxury products, such as cosmetics, are among the first items families are forced to do without when times are tough. However, this new lip gloss line—including “Jellie,” “Shimmer” and “Sparkle”—is priced to be affordable for everyone. Hundreds of new products from L.A. Colors and other wholesalers are currently being unveiled on the Lady de Cosmetic website. The fashionistas in the blogosphere have taken notice of Lady de Cosmetic, too. “The colors are exciting, the quality is fantastic and the price—the price just can’t be beat,” raves one fashion blogger.